Few people understand what it truly means to love someone, or something, in the case of the elephant star of the RPG platformer Elephant Quest. A jerk-off woolly mammoth has decided he likes your hat better than his and takes it by force, leaving our trunked protagonist angry and alone. Revenge, like usual appears to be the best course of action. I was pretty surprised with how fun this game was and the RPG progression coupled with the cutesy humor made exploring the many levels really fun. The most hilarious aspect of the game is the “visible inventory system” that features your character tying a rope around useful items he finds in the environment and dragging it behind him. The longer you play, the more like post-wedding transportation you look. It’s not exactly a challenging game, nor is it very long but that doesn’t matter much since its a free and browser based. It is not all about platforming though as there are enemies in the environment attempting to halt your progress. Luckily, you’re armed with a laser cannon that’s controlled by the mouse. The best part is that after you level up and complete a couple side quests you get more weapon filled wagons to add to the items already trailing behind you. 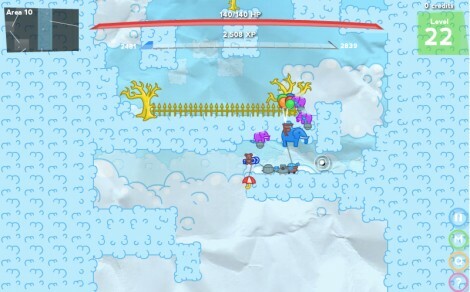 Add in the floating pink elephants that follow you around and by the end of the game you have quite an army. 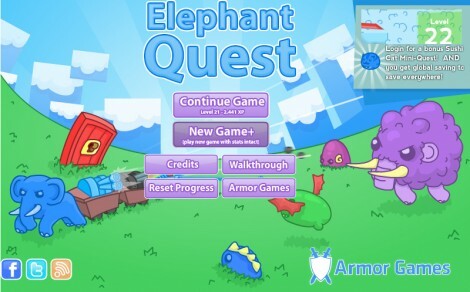 If you have a little time on your hands and want to shut half your brain off for a while, Elephant Quest definitely has the components you need for a satisfying time.